2008 shows a good sign in independent music industry in Malaysia (i strongly believe!). Bands are working hard to come out with their own material and plays more good shows. But beware, there are “Sharks” who are waiting to get hold of so called” the reign of indie scene” to get their profit by promising (bullshitting) a sky high hope. Let’s go to POH. For me, kawan full album CD is a dream come true for this “southern king of ska/punk”. i think they are also so excited about releasing this material after a long way of music career and a lot of problems occurred since starting to record this CD. Yeah..This is a DIY self produced CD, i mean it!. All the sweat and tears been poured into this production, this include their own self collected pocket money. Let’s talk about the CD itself. The production is clean, i mean at par as the CDs at megastores. I believe in buying CDs for the songs and also the art that comes with it. In Kawan, you’ll get both plus the happy feeling music too. As a personal friend to this band, i feel so proud to hear the first track Resah Awan with a peacefully arranged keyboard + horn sections. The guitar was at par as ska/punk standard. Just nice, not too spicy nor heavy. This track follows by Southern Suburb, a bit more straight for sing along punk ska song. 3rd track Tiada Idea, i feel like i’m at the beach drinking the coconut, seeing smiling beautiful faces ..damn I’m happy. Konspirasi is their biggest track (for me!) because with this song, this band cloud calm the rioting audience or making sad people smiling again. Straight forward ska/punk tune with a good dosage of positive reggae feel. You should take this song seriously by drilling down the lyrics (if you can understand malay). A good sax solo by Azmal..a cute one in POH! I’ll skip few tracks coz it will too long to write as they are all good damn happy tunes. Track 7 is Hypnotized, a skankin instrumental tunes for the skankers. Blitzkrieg Society is a statement song for the punks..better watch out!Ouwch..trumpet…more trumpet solo!! Rasa hati, a bit more to straight forward radio friendly punk song. This 10th track Malam is my favorite song. This songs proved that POH has been mature in musicality. It’s a blend of ska with some cha-cha but with Malay flavor. Again, drill into their lyric, and you’ll know the sensitiveness and love in their punk heart. A good approach on love song…jiwang beb! After crying to the previous track, let dance some more to the self titled track Kawan (friends). Let your body loose..just jump around to this tune, but beware of the lyrics. it’s a statement too..ska-ska all the way. I’m not comparing POH to any bands internationally. Why? With this album they already know what they want with their music. i admit kemuri, Rancid, Bosstone, Reel Big Fish have the element in their career but who cares. This is POH owns blend of coffee with their own sugar..condensed milk. It’s not to compared with Starbuck or San Francisco coffee. 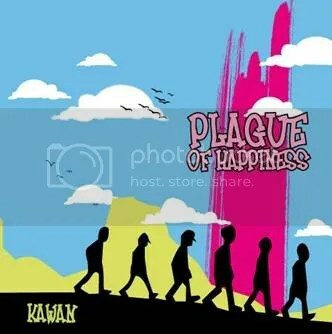 It’s Malaysian own happy tune with punk element. While I’m writing this review, Nas, Azmal & few other POH had already finished their so called Malaysian promo tour to sell their stuff. yes they did it without any guide or sponsorship. By now, they are heading towards Indonesia to give a taste of their music to the audience. It’s not fair if i only review the flowerish side about the CD. The CD could be more dynamic if there’s more money to finance it in the final touch. I love this CD so much but i need to tell that POH is more delicious to taste them raw in live shows. As for the vocal, I’ll be very excited to hear back the Demo version of song because my ears are so keen to the voice. However, producing a CD and recording sessions is not easy for a band. It takes a lot of commitment, health, soul and also feeling to deliver. thanks cos perform kt mlk aritu..
mereka ni mungkin ada persamaan yg sedikit dgn tipe-x dan band2 ska lain..
kerana mereka ini adalah golongan Ska Punk..
yg aku rasa lagi hebat dari rancid! anyway diorang main memang cun! sbb masing2 de character sendiri..
caya la bee.. best la lagu korang… espeacially lagu Malam,Blitzkrieg society & Skinhead anthem … layan beb!! « Goodbye Dubrow..Thank You For The Noise!